Yeah I still have all the original package installed from the first msi installer which put everything into LaptopTools. If I backup my fan profiles I should be able to import correct? 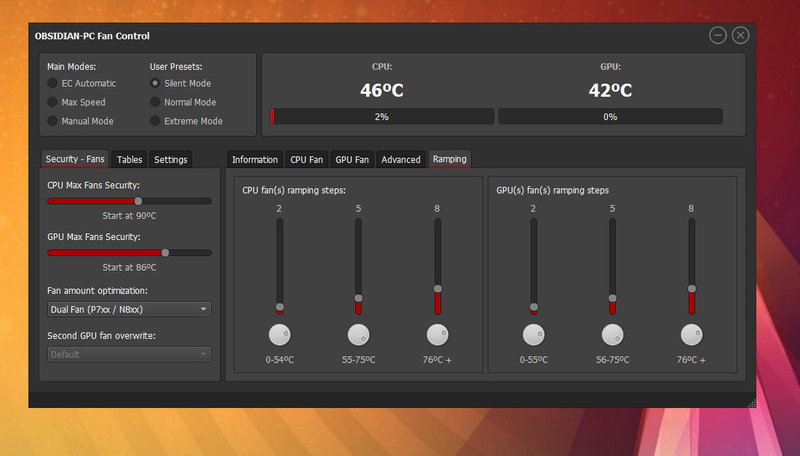 So i recommend using a lower ramping value for lower temperatures, so that RPM transitions are smooth. Use a faster ramping on higher temperatures so that the RPM can quickly catch up to temperature rises. - Device LOAD (use this as an anticipation option, by starting to increase the fan on load you can think of it as a prediction that the temperature will also rise). When this beta ends it will be official released along with up to 4K scaling. TheChosen0ne, HawkInOz and optimisez like this. 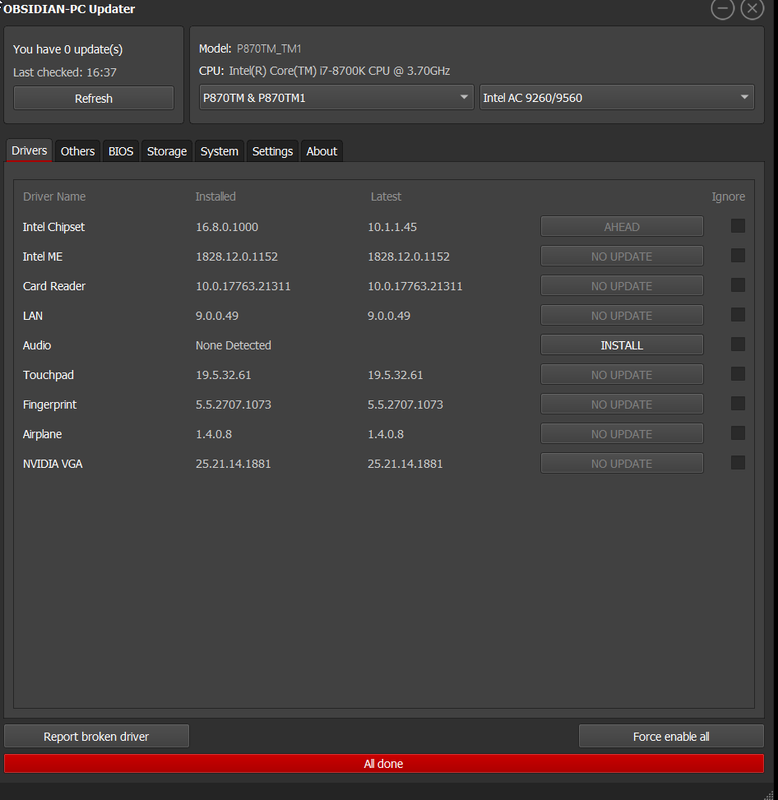 I have a problem with audio driver from the updater app, laptop is bought from you guys. Audio driver is not detected, doesnt show even which version is the latest, and when you click install, app hangs and gotta force close it. Where I can get the driver you guys recommend to install? I tried j95's modded UAD drivers, they work, but i have problem with my pluggable 3.5mm jack mic, since its mono and his driver offers only option for stereo mics. The old license will work with Updater. That is actually a BUG from the Updater... i will release an update ASAP!!! Seems a bit counter-intuitive. I would think it would only tell me how many updates I actually have to install (not ignored). Maybe it should state: "X Updates Available" for the total number that could potentially be installed, and "Y Updates Ready to Install" for the actual number that would be installed, subtracting out any Ignored updates. Thanks. I tried that too and it just says invalid license when it works fine on the orig program. Maybe its because you had to change my UUID from the base order last year? Hummm you actually make sense, for a change... *joking* thanks! Will fix that in next update! Can you please PM me with your license order number and your current UUID (copy and paste from the app screen). I´ll fix that for you! EDIT: Not a single FAN CONTROL Beta report?!?!? Can someone test it please!!!!! 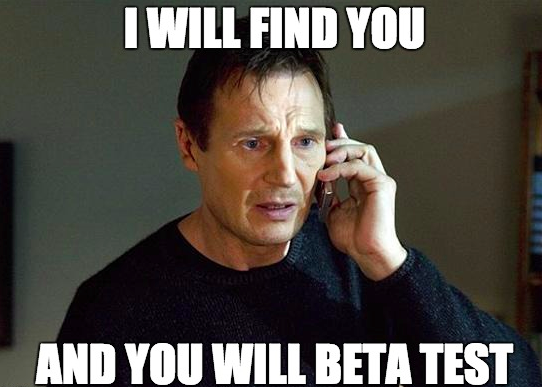 *insert needy teen voice"
Just read some posts back about the latest Beta and please give it a try guys!